Has anyone checked into the trade in value on their cars. I was at the dealer today getting my last free oil change and sure liked the Blue Classic, It was 37k. Mine was 33500 when new. He said he could check into it but I really wasn't that serious. I installed my new Mopar T-handle shifter today. I like it. KBB still shows my car is worth every penny I paid for it as a trade in now. That can,t be right. Mine only has 7500 miles on it, had it a year this week. Sure wish I would have bought the leather seats, drives me crazy. I know I can custom order them at several places but funds arent high at this time. I traded my 09 R/T B5 Blue 6 spd with 1250 miles towards a Plum Crazy which I am still waitin on and only got 30,000 for it. I tried ebaay and my highest offers were in the 28500 range. Seems the value on used is too low right now, unless you can get private buyer. 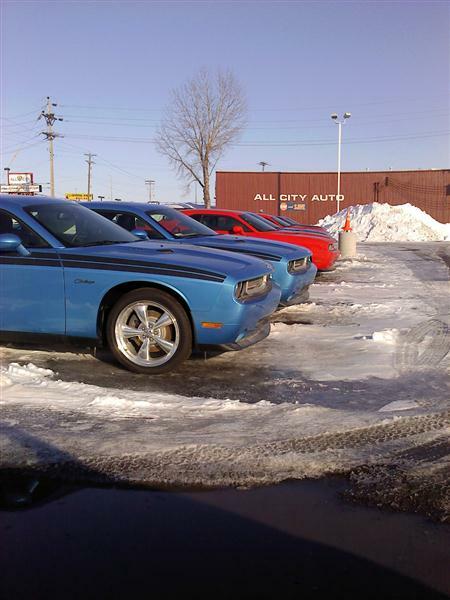 Our local dealer has like 4-5 used Challengers on the lot. They are asking about 2K lower then you can but a new one for. 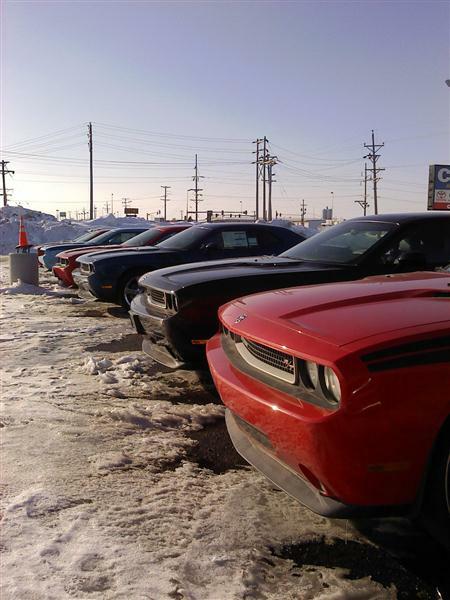 The demand must still be high as they had around 30 new ones on the lot a month ago and they are mostly gone now. Kell Blue Book is a "wish it was worth that much" book, when we bought our new Daytona in 92 (it's a 93) it was two years old with 25,000 miles on it before the book showed it below what we payed for it. They are restocked!! WOW 24 new ones and 6 used as of Saturtday. mine is a 09 SE/G and has 23,000 miles on it, KBB show it to be worth about 23,000 and my payoff is just above 22,000. still a bit out of my budget to trade in and get an RT. even though my dealer has a base RT with chrome clads for $33,000.